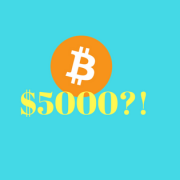 Bitcoin $5000 USD This year?? Bitcoin $5000 valuation is coming! Since my last post in January about the Bitcoin of how it would perform this year. I knew it was going to grow in value but to be honest I didn’t expect that it would grew in value this hard. At the moment of writing this blog, Bitcoin is currently traded at 2395 USD. So what has happend? Since the legalisation of Japan on Bitcoin and having more countries taking a interest in Bitcoin. The volume of demand for Bitcoin have increased rapidly. Like madness. Here take a look at these graphs. Central Banks are increasing interest rate again. When interest rate increased then it means you hard earned money will decrease in value as good and services are increasing in price. That is why clients of investment firms, hedgefunds, institutional investors are investing big in Bitcoins. They don’t want that their wealth be decreased in value just because the goverment messed things up like India last year. Bitcoin is getting more and more accepted around the world. More merchants and consumers are starting use Bitcoin as way to buy things. Since the legalisation of Bitcoin in Japan, the trade volume in Bitcoin went sky high. This year there was a major growth in merchants that accepted Bitcoins as payment. Now why would they do that? For me it obvious that more and more customers are wanting to pay their products/ services in Bitcoin or any other crypto currency. Japan for example is going to have more then 260.000 stores that are going to accept Bitcoins and Ethereum as payment this summer. The whole bitcoin fever is huge! South Korea, Russia, Thailand are all currently looking if they are going to legalize bitcoins or not. So why is it so huge? Why are people using bitcoins instead of the old cash? People are using bitcoins for a lot of different reasons. We think that the number one reason that people are using Bitcoin or are investing in Bitcoin, is that they are fed up with politics and central banks for manipulating the currencies to their disadvantages. Like for example in Europe. The ECB is doing their best to make the European economy better. With the tools they are using it has some side effect. One of the effect is a low interest rate. Some banks are struggling to make a decent profit. So they lower their cost by firing people and decrease the interest rate. Which means that people are getting less interest on their savings account. For some people the interest rate that they used to receive for saving their money on the bank went negative. Which means that for every pound that you are saving. You will have to pay the bank to have your money at their bank. Kinda weird though since most of these banks were saved by your tax money. The ECB is not the only one. Almost all central banks around the world are trying to boost their countries economy. With the side effect of making things more expensive for the normal people while their money becomes less valuable. And the richer became richer and richer. It’s not fair right? To get justice for the normal hard working citizens, Bitcoin was brought to life. The same applies for other crypto currencies. While more people are using Bitcoins to pay. The mainstream public are not using Bitcoins to pay right now at the moment. Because they don’t know what the real value of Bitcoin is. ( Because all what the mainstream media does is informing how insane it is that Bitcoin and other crypto currencies became so much worth!). But we think that in time the mainstream public will slowly get to know about what the real value of crypto currencies are. We think that the majority that are using Bitcoins right now are merchants. Why? Because with Bitcoins merchants can get more advantages if they play it smart. Because with Bitcoins you don’t need anyone to make a transaction. So this means that the merchants doesn’t to have pay a transaction fee to the banks or to any other middleman. This way it will save them money. And another thing is that merchants have to worry less about the value of the other currencies if they are doing business international. Both parties can just agree upon a fixed Bitcoin price. So you don’t have to worry about that your profit might decrease because the GBP has become too expensive or too cheap in comparison with other currencies. Bitcoin $5000 USD valuation this year? With huge growth of start up companies that are active in the crypto currency world. Mainly in Bitcoin and Ethereum, it will be just a matter of time before the mainstream public will start to use Bitcoins and other crypto currencies types. On the short term there are countries like Russia, South Korea, Thailand, Australian, who are planning or looking into legalizing Bitcoin. And with gold rush that big investors and investment funds are having for crypto currencies, we think that there is a good chance that Bitcoin $5000 USD value will happen this year. https://101trading.co.uk/wp-content/uploads/2017/07/5000_.png 315 560 Khanh https://101trading.co.uk/wp-content/uploads/2015/07/logo101trading2.png Khanh2017-07-06 07:01:222017-12-18 01:49:56Bitcoin $5000 USD This year?? Ethereum: What is it? And why is it getting more popular? The month June 2017 has been a crazy month for crypto currencies. The ETH went crazy, going in prize massive as Bitcoin did. If you have been watching Ether for the last few weeks. Then you would have spotted a few really good trading opportunities that would give you a huge profit. So in this blog we are going take a look at Ethereum and Ether. What is Ethereum and why is it getting more popular? When you look at indices and the main stream news about the Ethereum, you might think that Ethereum is just another alternative crypto currency of Bitcoin. But if you do some more research on Ethereum, you will find out that it is not true. Ethereum is more then just a crypto currency. It is a very big highly advanced innovative platform for programmers and developers. On this platform you can build all kinds of apps such as games, financial app, social networks, basically everything you can imagine off. What makes Ethereum so special is that the platform is build on a decentralize system. Which means that there is no Authority that is holding all the information that is been used to create those apps. This platform was created with the intent that people can build programs that we may or are using every day. So this way there no middle man, and no central server to house that information. Without a central server, there is no main authority to change or shut down these programs without the entire community knowing about it. Because of this advantage many programmers are hyped to build their apps on Ethereum platform. In order to program apps and run it smootly,you willl need Ether. Ether is like gas for car. Without ether, your app can not function basically. There is only two ways of getting Ether. One is through mining and the other one is through buying ether on the market.So when you see Ethereum price quote on the markets it is really Ether actually. As the platform can’t be bought. For a better understanding of Ethereum please watch this video of Vitalik Buterin (inventor of Ethereum) below. How can I start in Trading Ether? Right now there is a lot of movement in the price of Ether. If you want to take make a profit on all those price movement. There is a option to speculate on the price of Ether. Ethereum coins are very volatile at the moment. As a trader you can take advantage of that. When the price of Ether goes up then you will automatically make a profit. But did you know that you can also make a profit when the price of Ether goes down? Because this happens all the time. You can make money by going short on Ether with a good online broker. This way you can earn a good profit too. A really good online broker that gives you the opportunity to trade in Ether is Plus500. At Plus500 you can open a practise account for free in a very simple way. You can use this practise account to explore the opportunities in trading Ether. With the Plus500 software you can invest/trade in Ether with one mouse click. Because of this you can easily take advantage of all kinds of price movement of Ether. Click here to try out trading Ether at Plus500 for free. Why is Ethereum getting more and more popular? One of things that I like about the platform is that it gives you the possibility to create your own crypto currency. But there are many other advantages that Ethereum offers to programmers. That’s why this innovative platform is getting more and more popular. Because it is unique in his own kind. The more and more programmers that are choosing Ethereum to build their apps, the more ether will be needed. As the ether mining takes a long time and you need to know the right knowledge. So I think that on the short term the supply of ether will be smaller then the demand for ether. Which will probably result into a higher price value for Ether. But in all honesty I think that the recent rally of Ether was because of Bitcoin. Bitcoin went crazy in price value this month. Which surely took many other crypto currency including ether into a up trend at a higher speed. Because many investors doesn’t want to miss their chance like they had on Bitcoin. That’s why many jumped in the other alternative crypto currencies. After taking a look at Ethereum. I am confident that Ethereum can stay for a very long time. I am not sure if the value of Ether will surpass the value of a Bitcoin. Because you can produce ether unlimited while Bitcoin is limited. However if more and more programmers and developers are going to use this platform then the demand for ether will increase. As you all know if the demand is higher then the supply then price will increase. In this case the price of ether will increase as long the demand is higher then the supply. As far as I know that it takes on average a month to mine 5 ether. Right Bitcoin and Ether are trade and invested in high volumes. If you don’t have the stomach for the dailey huge changes in prices then don’t trade but invest for long term. Keep an eye on our website because from now we will keep an track on Bitcoin and Ether. 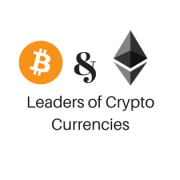 https://101trading.co.uk/wp-content/uploads/2017/06/Leaders-of-crypto-currencies.png 315 560 Khanh https://101trading.co.uk/wp-content/uploads/2015/07/logo101trading2.png Khanh2017-06-29 07:01:402017-12-18 01:52:37Ethereum: What is it? And why is it getting more popular? In a few weeks it will be Christmas and after that we will have a new years eve. If we look back at 2016 a lot have happened. 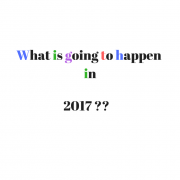 But 2017 stock market will be the year that will bring us a lot of new hope. And for some a new beginning (US ,UK, EU). In 2017 there are a lot of elections in Europe. Countries such as the Netherlands, France, Germany and Italy will choose their new presidents or prime ministers. These elections might give fear to investors, which will lead the European stock market into a bearish trend. The prime minister Theresa May is aiming to start article 50 by the end of March 2017. By triggering this Article 50, the Uk can start the procedure and negotiation talks to leave the EU union. When the Brexit was voted, Juncker was eager to start the negotiation talks as soon as possible. Seemed he was well prepared for that. But I think times have turn a bit to the Uk advantage. Because the UK has already a few companies, that promised to stay after the Brexit. And a few companies like Apple promised to keep on investing and creating jobs in the UK. The Brexit negotiations talks will have an effect on the European stock markets for sure. Whether it will be negative or positive it is hard to tell. But one thing will be sure is that both parties will do their best to create the best environment for business to go or stay at their place. So in the end the Brexit thing might be the best thing that has happened for businesses. As a thought I think when the start of the Brexit negotiations talks begins that the markets will react for a short period of time. Because I think that both parties will try the calm down the markets. After all a crashing financial markets looks bad for politicians. And the ECB and BOE won’t stand on the sideline either. On one of my youtube videos, I had predicted that Donald Trump would win the election. Since the win of Trump the stock market has been hitting new all time high records. We are currently in a bullish trend.As long Donald can make his promise come true about the tax reduction and getting rid of some regulations rules for businesses in the current positive economic growth of US, then I don’t see a reason yet of why the bullish trend of the 2017 stock market has to stop. However the markets will go down as soon Donald’s China teasing takes a serious form. Right now I think that Donald is testing the waters with China to negotiate a better trade deal. A few other things to keep an eye on are the Russian 2017 stock market and its currency Russian Rubble. I think both of them will go higher in value in 2017. I think that Putin will succeed in persuading US and Japan in cancelling their economic sanctions against Russia. And more importantly I think that Oil prize will stabilise. Both of these factors will benefit Russia well. Bitcoin will continue to go in price as well, the reason for this is mainly China. China will continue to face challenges to stabilise their currency Yuan against the US dollar. Starbucks stocks still a safe investment? Today we are going to take a look on Starbucks stocks. We are going to look at three things. If you look at the chart, you will notice that the stock price movement has been really small in the last two weeks. Which means that the current trend of Starbucks stocks is sideway’s. It doesn’t really go up big or go down big. So far this year Starbucks stock price hasn’t performed well compared to last year. But it didn’t performed worse as most of the oil companies. 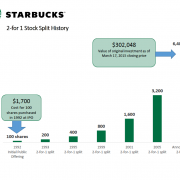 Since the stock split last year, the price value of the starbucks stock has increased with roughly 23,67% . If you take look again at the last two weeks performance of the starbucks stock price it seems that we are about to change the trend. Meaning that we might go up again. The volume of trading starbucks stock have dropped significantly. As you see, the lower the price go , the lesser investors are willing to sell their stocks. How is the company doing in term of business? According to their last announcement on 11 August 2016, Starbuck is going to expand their distribution center with a extra of 1.2 million square feet. With this expansion, the distribution centre capacity will be increased with 35%! So this means that Starbucks is expecting that their business will grow more. Which is good news for investors like us. So let’s take a look of how the business was doing in the third quarter. We see that sales in the US has increased with 4%, In China had has increased with 3% and in Europe there was a decrease of 1%. The net revenue grew with 7% to a record of 5.2 billion dollars. 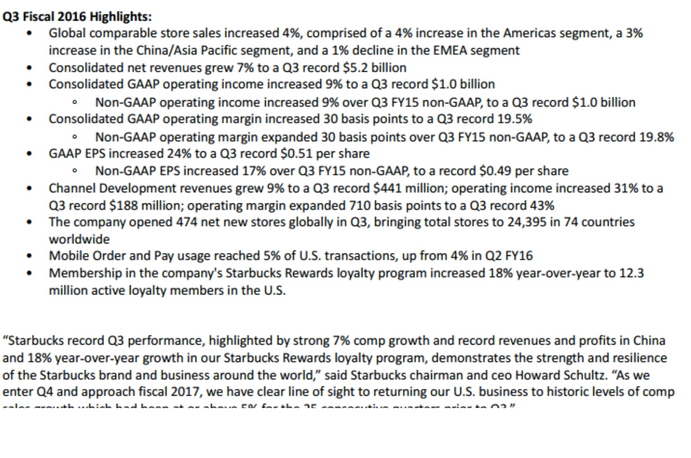 And 474 new Starbucks stores were opened in this 3rd quarter. So we can safely say that the business of starbucks continued to grow. But it hasn’t grow as much as it did in the previous quarters. If you look at that chart. You will see that sales growth has been decreased. According to Howard Schultz , the CEO & chairman of Starbucks, sales growth will back on his normal track of 5% or more soon. So how is this going to reflect on the future stock price? When the third quarter results of starbucks was release, the stock price went down with 4%. And since then it kinda got stuck on that price level of 55 usd. After the dividend pay out of Starbucks earlies in august, it seems that stock price is consolidating at a price range of 55 dollars and 56 dollars. If this is so , then it means that the price range of 55-56 dollars will be the new support level for the starbucks share price. The only way to get this confirmed is to watch the stock price of Starbucks bounce off that price level a few times. If this going to happen then we may see that the stock price of starbucks will move into a bullish trend. And i believe that once the stock price close above the 60 dollars. That we will go into a strong bullish trend. If you are looking for a long – term perspective. I think that the fundamentals of Starbucks stocks is solid and with stores expansion and adding new products such as recently gluten free products and Almond milk. I am confident that the Starbucks share price will eventually go to newer heights. 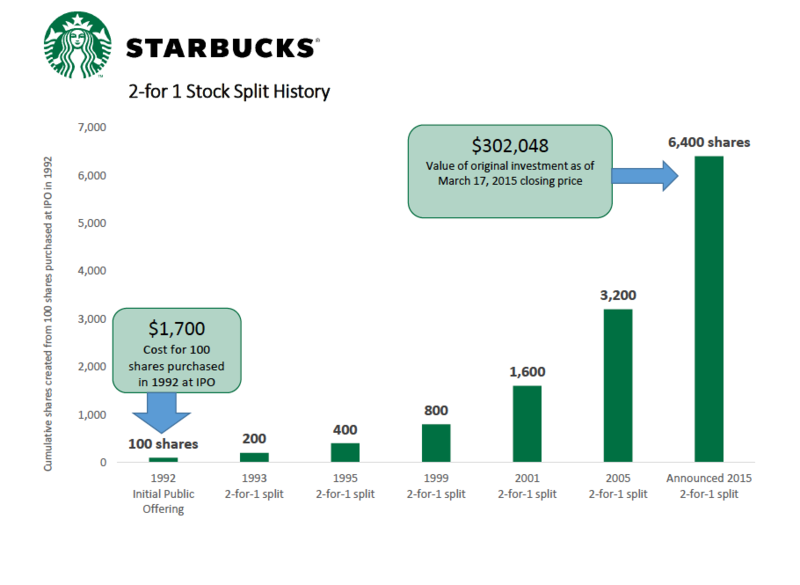 And one more thing… If you had bought the 100 Starbucks stocks at ipo for a total investment of 1700 dollars in total. ( that was the introduction price). Then you would now own more Starbucks stocks because of the stock splits, that has happen a few times. But your current value would be around 300.000 dollars. As long as Howard Schultz remains CEO , then we all will be fine. 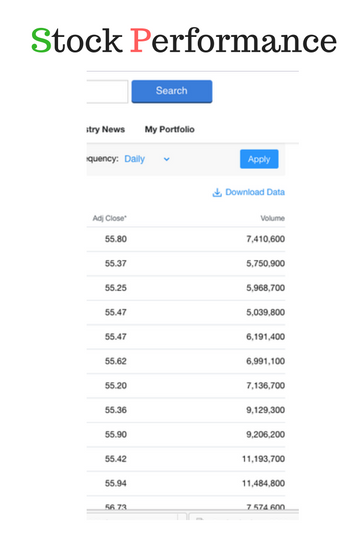 https://101trading.co.uk/wp-content/uploads/2016/08/Screen-Shot-2016-09-01-at-00.48.33-e1472683801323.png 665 910 Khanh https://101trading.co.uk/wp-content/uploads/2015/07/logo101trading2.png Khanh2016-08-28 23:34:242019-01-25 11:34:20Starbucks stocks still a safe investment? Finding ways to put your money to work is important and something that you need to take very seriously. Without the right investment strategy, it will be very hard for a person to get the right results from this process. There are a number of things out there that can garner a person a lot of money if they invest in them. The world of bitcoin trade is wide open and has a variety of different investment opportunities. Just like with the trading of stocks or bonds, there are a number of rules and things that you will have to consider when trying to have the success with bitcoin trade. When trying to have success in the world of bitcoin trade, you will first have to think about what you have to spend. Taking the time to work up a budget before investing is a surefire way to avoid overspending during this process. The last thing that you want to do is to invest money that you are using to pay for your home or other important expenses. Doing this will only result in you getting in a financial bind and not being able to continue trading. Going in to speak with an investment professional is a great way for you to get some guidance regarding what needs to be done and what you can invest. Once you have figured out what you have to spend, you will need to take the time to find out what your goals are. Without a clearly defined goal for each trade, you will not be able to track the progress you are making. In most cases, a beginner to the world of bitcoin trade will not know what their goals are, which is why using a professional to help is important. A professional in the world of investing will have no issues helping a person define their goals and them help them meet them. Just like with any other type of investing, the more information you have regarding the bitcoin trade industry, the easier you will find it to get the right trades made. There are so many different publications and websites out there that will allow you to stay up to date on all of the developments in the bitcoin trade industry. Staying up to date on this industry will allow you to strike while the iron is hot and make the right decisions regarding what to do to make money. The time that you invest into this type of research will more than pay off in the end. Finding the right information with bitcoin trade is essential. Without the proper guidance during the beginning phases of your trading, it will be very hard for you to have success. Bitcoin currency: What are the benefits of this currency? Being able to buy things with ease is a top concern for a lot of people. Nearly every online retailer accepts a number of payment methods. You will have to take the time to figure out what type of payment method is best for you and your needs. One of the most popular form of payment in today’s digital world is the bitcoin currency. This currency is used strictly online and comes with a variety of benefits. There are many people out there who have heard the name of this currency, but fail to realize what it is all about and the benefits that it has. Below are some of the reasons why bitcoin currency is becoming one of the most popular payment methods around the world. The biggest benefit that comes along with using this type of currency is the freedom that it allows the user. When using bitcoin currency, a person will be able to transfer it and use it whenever they want. There is not compensation that has to be made regarding banking holidays or even time of day. Due to the all-electronic nature of bitcoin currency, a person will be able to spend it or transfer it all times of the day. 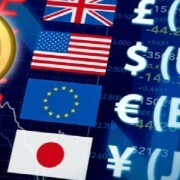 With other types of currencies, a person will have to wait until banks are able to process their transfers. 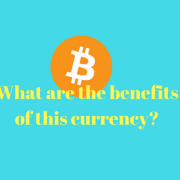 One of the other benefits that come along with using bitcoin currency is that the security of the currency is in the hands of the users. Since the users are the ones that are doing the transactions, they will be able to control their own security. There is also no way for vendors to charge any hidden fees on the transactions that are made with the bitcoin. The private information of the bitcoin currency user is hidden from view, which means that you will be able to get the right purchases made without putting yourself in danger. Among the most attractive features of this type of currency are the very low fees that you will have to pay when using it. In some instances, there will be no fees at all when using your bitcoin currency. Before you make a purchase or transfer, you will have to take the time to find out what you are being charged. The more you are able to find out about the fees, if any, the more at ease you will feel about spending your bitcoins. The last thing that you want is to be ripped off due to neglecting to read the fine print before a sale is made. Investing the time into finding the right currency is important and will more than payoff in the end. The use of bitcoin currency is exploding due to the fact that it is easy to use and will retain its value over time. https://101trading.co.uk/wp-content/uploads/2016/02/5000__1.png 315 560 Khanh https://101trading.co.uk/wp-content/uploads/2015/07/logo101trading2.png Khanh2016-02-28 13:00:122017-12-13 22:43:08Bitcoin currency: What are the benefits of this currency? In this article we are going to discuss whether it is time to buy Volkswagen shares. We will outline the pro’s and cons of buying Volkswagen shares. After reading this article you can make your own decision whether you should start in Volkswagen shares or not. What have happened to Volkswagen shares? The American authorities caught Volkswagen cheating on the pollution test. Volkswagen had software that was able to sense when a vehicle was being tested for a pollution test. The software sensed that based on the position of the steering wheel, vehicle speed, the duration of the engine’s operation and barometric pressure. With this software Volkswagen diesel cars produce less pollution on the test while in the reality they produce more. Since the American Authorities have found that out the Volkswagen share prices have been dropping significantly. At the lowest point Volkswagen share had lost more then halve of its stock value. The current Volkswagen share price is only a technically recovery from the crash. Volkswagen might receive such a huge penalties that it will be almost impossible for the company to stay profitable. Currently is impossible for me to find solid grounding reasons to start investing in Volkswagen shares for the long-term like I have with Starbucks. With Starbucks shares I have good grounding reason to invest it for the long-term. In lesser than a year my Starbucks shares almost doubled in value. I think at this moment the only way to get profit from Volkswagen shares is by trading it. At the moment of writing this blog the current value of Volkswagen share is 103.70 Euro. I think this could be a price pivot point where the share will drop in price again. 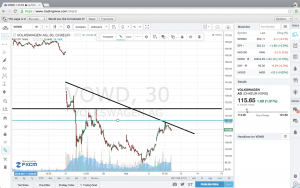 If you are looking at the chart of Volkswagen shares, you will see that (according to our technical analysis) Volkswagen shares are still in a downtrend. 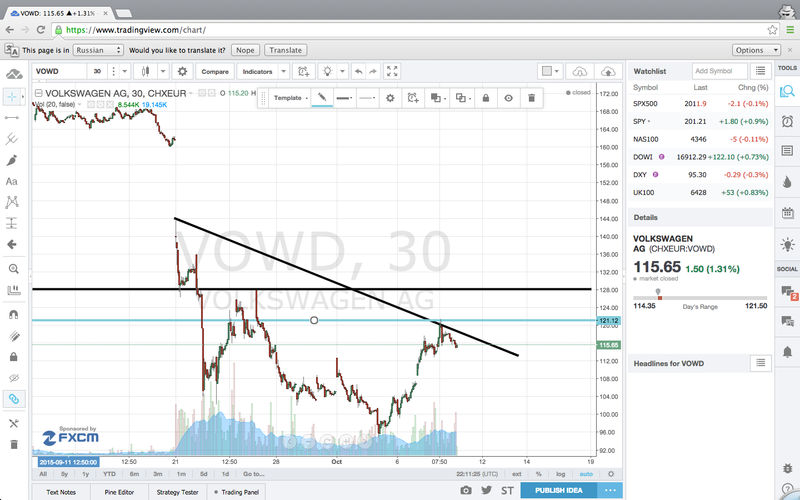 Every technical analysis indicator such as the trend lines, horizontals, support and resistant lines are indicating that Volkswagen shares are in a downtrend. Today is the PayPal IPO. After thirteen years being with Ebay, Paypal is now a separate company on the stock exchange. And that is good news for us investors and traders. If you are interested in investing in Paypal then you must read this article. In this article you will get to know what the business model is from Paypal and what the potential earnings can be. Why did Ebay and Paypal seperated from each other? The reason why they have separated is because the mobile payment market is showing big promises as the e-commerce market keeps becoming bigger and bigger. And more and more big tech companies like Apple , Amazone and Google have created their own mobile payment system in order to benefit from the growth of mobile- and on-line payment market. If Paypal stay with Ebay they will be limited in teaming up with other e-commerce websites. (as they see Ebay as their rival) With Ebay gone now it will be interesting to see on how the new income stream of Paypal will look like. With the extra cash that PayPal IPO gives it will be interesting to see of what kind of companies PayPal will acquire. Lets take a look on how PayPal earns their money. PayPal generates revenues from fees charged to consumers and merchants for different payment-related services. PayPal allows consumers to transfer funds to merchants in a secure manner through the PayPal digital wallet. The cool thing about the Paypal Digital Wallet is that it not includes internal resources such as the PayPal account balance and PayPal credit account but they also include external resources such as bank transfers or credit and debit cards. And one other thing PayPal does not charge consumers for funding or withdrawing funds but they only charge fees when consumers are lending money by the PayPal Credit. Most of PayPal’s revenues are generated from transaction fees that is charged to merchants. The fee percentage vary from 2.2% + $0.3 per transaction for eligible merchants to 3.9% + a fixed fee based on currency received for international fees. With a other service PayPal Here Paypal charges a transaction fee of 3.5% of the transaction value and offers a free point-of-sale station for small businesses to process credit/debit cards in their stores. 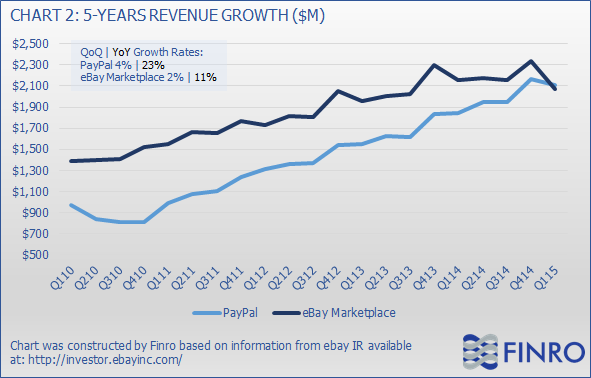 As you can see in the graph above PayPal has been growing very strongly. In the first quarter of 2010, PayPal processed $21.34 billion in payments. By the fourth quarter of 2012, this amount grew to $41.47 billion. In the first quarter of 2015, the amount of payments processed grew to $61.41 billion. This represents nearly 300% growth in payments processed since 2010. This number is likely to grow in the future as PayPal expands its mobile payments business. PayPal processes approximately 30% of its payments on mobile devices, up from merely 1% in 2010. With these good numbers it makes it very interesting for investors to invest in the PayPal IPO. The long-awaited PayPal IPO is expected has finally taken place. With the PayPal’s impressive TPV and net revenue growth rates on top of the promising expansion potential it makes the PayPal stock a very attractive growth investment. Without the restrictions of Ebay Paypal can focus on offering their services to the competition of Ebay as well. So there is a very good chance that Paypal can grow more in value over time. The first few weeks could be very volatile , so short term traders can benefit nicely from it.